The summer of 2017 in Chicago is quickly becoming one for the books as another popular music festival releases it’s 2017 lineup. 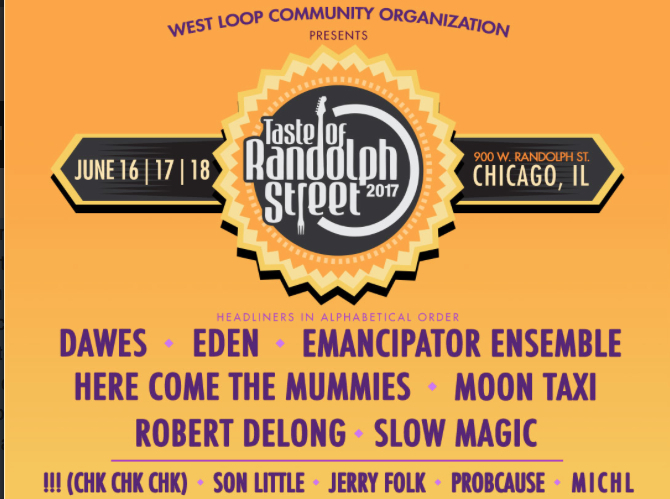 This time is for the west loop festival called, Taste of Randolph. This street festival has been growing in popularity every year since it’s start over two decades ago! Commemorating the iconic street festival’s 21st Anniversary, Star Events and WLCO will bring together the biggest and brightest names in Chicago dining, featuring over 18 restaurants exemplary for delectable menus and irresistibly unique flavors. Silver Wrapper has curated a list of the nation’s hottest up-and-coming bands and musicians, as well as the biggest names in Chicago house music, performing on two stages and a DJ stage, to entertain guests on their culinary adventure. Taste of Randolph benefits the West Loop Community Organization, which has been advocating for the West Loop neighborhood since 1991, supporting local businesses and economic development. This year, the festival will be bringing in artists such as Dawes, Eden, Emancipator Ensemble, Here Come The Mummies, Moon Taxi, Robert Delong, Slow Magic and !!! (CHK CHK CHK) to name a few. Schedule for June 16th, 17th and 18th, this weekend will be filled with not only the hottest music around, but coolest treats as well with food from vendors all around the Chicagoland area.